Kind of with Shadowfart69 on this one. 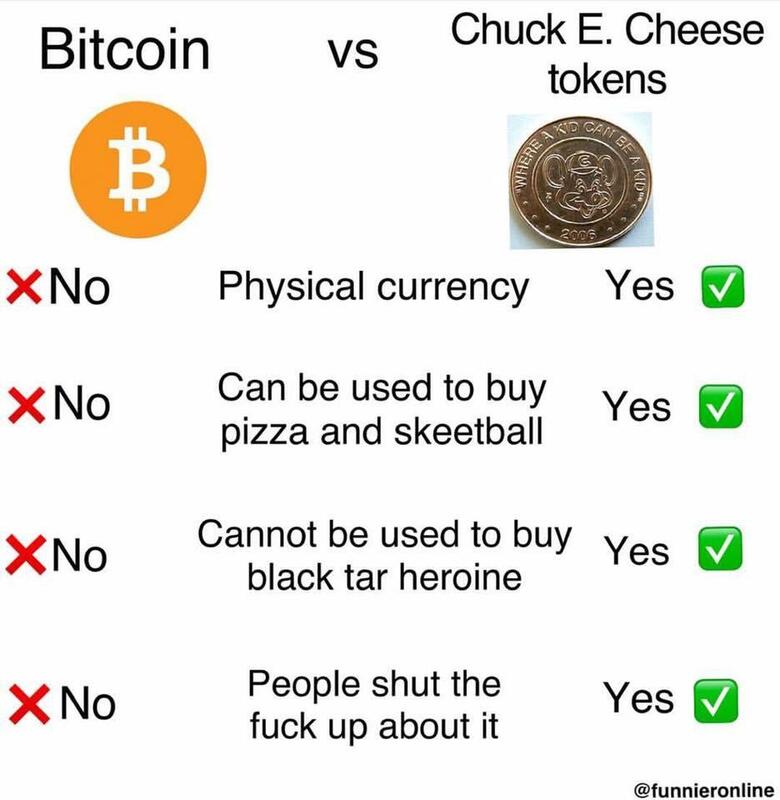 A hoax about a man selling Chuck E. Cheese tokens as bitcoins has gone viral on Twitter. The post was published by Huzlers, a site that tells people its content is "fauxtire & satire," meaning completely made up. The story says a man scratched out the Chuck E. Cheese logo of his tokens and drew in the bitcoin logo before selling the coins on the street. The punishment for this fictional crime was a five-year prison sentence. Pablo Reyes, who owns Huzlers, told BuzzFeed News the post was inspired by the recent surge in interest about bitcoin. "And everyone loves Chuck E. Cheese 🙌,," he added. Reyes said the bitcoin vs. Chuck E. Cheese tokens meme that's making the rounds online is what made him think of the post. Reyes said the article is not meant to be taken seriously. "We have a large following on social media so most of our articles spread with people who know it's fabricated and just wanna laugh [or] maybe trick a coworker, but it's all in the name of entertainment," he said. People online fell for the article, immediately siding with the "arrested" man. Some called for him to be freed immediately. Shadowfart69, speaking for many Twitter users, declared the hoax's protagonist "man of the year."